If colours could speak, it would form a language of its own. And it would be a language that Danielle Boodoo-Fortuné is fluent in. In her first solo exhibition, ‘Criatura’, Boodoo-Fortuné provokes themes of womanhood, love and nature. In an instant, her colours grab you. Bright hues complement her refreshing arrangement of mixed media art, bringing vibrancy to the white walls of The Trinidad and Tobago Art Society. The 27-year-old artist focuses our attention on the women of ‘Criatura’. But don’t mistake this female-dominated collection for a feminist motion. There is a deeper story behind the women portrayed in Boodoo-Fortuné’s art. As I scan her exhibition I notice the artist sitting, focused on her laptop. She moves around the room as I make notes and photograph her work. But she never interrupts. She does not introduce herself. She does not bat her eyelashes and declare: ‘Oh hello, I am the artist’. She remains taciturn and incredibly humble. And what I enjoy most is that she let me experience her art in my own way. I am thankful for that because now I have a completely unbiased review that tells you the truth about ‘Criatura’. As a child, the artist developed a fascination for drawing girls – that was- until a close relative made her feel ‘ashamed’ for this. It was an experience that turned the artist off drawing entirely. She explains: ‘For a few years I stopped drawing altogether, or sometimes, when I could bear it no more, would sketch hurriedly on scrap paper and throw it away right after I was finished.’ Despite how unnerved she felt as an artist, Danielle admits she gained something invaluable from that period. The Trinidadian native reveals: ‘I find something powerful and necessary in drawing women, drawing upon my own experiences and understanding of what it is to be.’ The women of ‘Criatura’ embody this power. 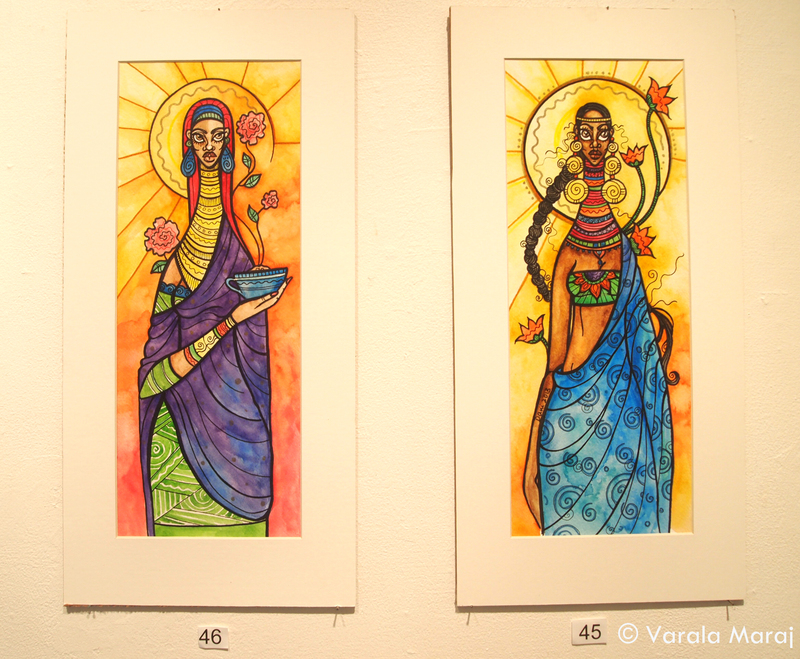 Paintings titled ‘Our Lady of the Rains’ and ‘Our Lady of the Drought’ welcome you at the start of the collection. With bold reds, bright yellows and dark greens, Boodoo-Fortuné juxtaposes the simplicity of primary colours onto a textured wooden surface. The ladies are portrayed with elongated necks that mimic the wood’s slender, rectangular shape and appear as a recurring theme throughout the collection. Boodoo-Fortuné also demonstrates a knack for matching the right colours to the most appropriate medium. She trades her primary colours for more complex pastel shades when going from wood to paper. Soft blues transform into lilacs that merge seamlessly into a dazzling assortment of watercolours. The shift is dramatic. It makes each work more refreshing than the last, as you browse her 46-piece display. The artist proves she can handle just about any medium. ‘Evening Tea’ and ‘Separate and Same’ use solid acrylic colours and fabric paint on brown cotton, giving a crafty, homemade feel. Then, with pieces like ‘Mango Season’, ‘Providence’ and ‘Mother of the Hummingbirds’, Boodoo- Fortuné layers paper cuttings of glittered roses, birds and butterflies. With these elements, the artist accomplishes the perfect balance between adding texture and dimension without distracting from the watercolours. The cuttings provide a whimsy that makes you do a double take, literally. One of her most outstanding pieces shares its Spanish name with the exhibition’s title. I’m referring to none other than the brown-eyed beauty, ‘Criatura’, which translates to mean ‘creature’. Yellow butterflies are portrayed flying around the face of a woman on this large watercolour portrait. With ruby lips, thick, arched brows and eyes wide open, her description might sound familiar. But this is no ordinary woman. The title piece showcases some of Boodoo-Fortuné’s finest watercolour work. Tree branches, leaves and roses decorate the background, along with the most breathtaking mix of lavenders, pinks, turquoises and yellows that not even the best DSLR can capture adequately. The woman quickly loses her natural tan to these colours which blend into her heightened neck, hair and defined collarbones. A motif unfolds, bearing leaves, flowers and curved lines that ripple across her colourful skin. The woman intrigues you. She is mysterious and -like all Boodoo-Fortuné’s female subjects- she is compelling. But this still doesn’t beat my favourite. Titled ‘Oleander’, this 18” x 24” piece fuses a kaleidoscopic display of watercolours, acrylics and pen. This half-body portrait looks like Boodoo-Fortuné’s take on a bride. And she is perhaps, the most colourful bride I have ever seen. She wears a canary yellow veil, heavily embellished with precisely drawn red circular symbols that repeat consistently to create a motif. This inspires a series of cursive swirls throughout the scalloped-edges and lining of the veil which is so big that it cocoons her. Her dark hair is adorned with two pink flowers, identical to those in her bouquet. The bouquet takes the form of a small floral plant, still clenching onto the earth it was dug from. It is interpreted to be an oleander plant, known for being poisonous in all it parts. The roots of the bouquet protrude and wrap around the bride’s wrist. She looks so comfortable and unaffected by the poisonous plant entwined onto her body that I’m worried about the groom. Which came first- the poet or the artist? Most people use words to express themselves. Others use art. But Boodoo-Fortuné finds a way to combine the two. 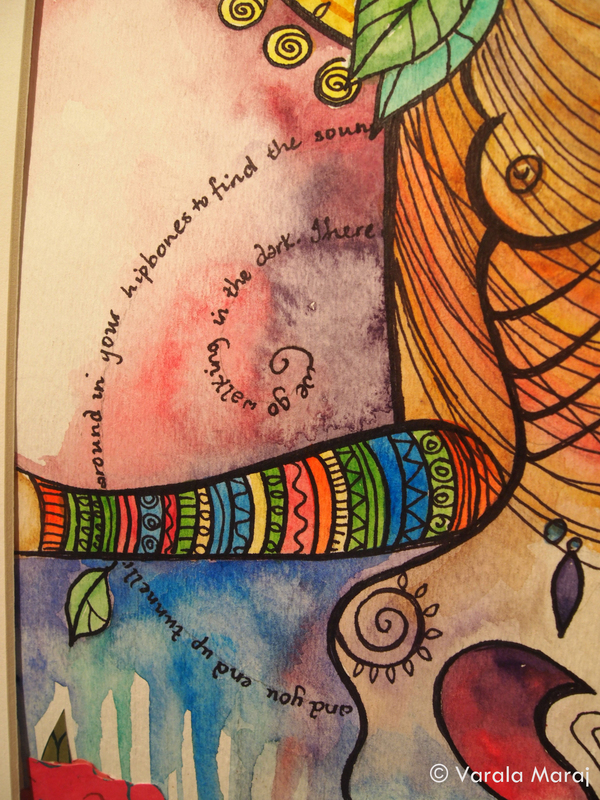 The most evocative details of her art are the words that I myself cannot write. And that’s because only Danielle Boodoo-Fortuné could compose such moving poetry. Lines of writing make delicate swirls across several works. The one that stays with me the most is Oleander’s: ‘They come for you, tell them who you are, who you’ve always been…the evenings are lonelier than she can bring herself to say…but love you never needed saving… make out the mystery of your centre’. Her words are captivating. They haunt you with their sincerity. It’s no surprise to learn that the artist is widely recognised for her poetry, which has won her several awards including the Caribbean’s Charlotte and Isidor Paiewonsky Prize in 2009. Another pair of ladies close the show, making the exhibition feel complete. They are wearing so many neck rings that their neck and shoulders are hidden. This detail explains the elongated necks and sharp clavicles expressed throughout the collection and ties the whole display together. By the end, it is hard to believe these are simply two dimensional women. Their distinctive aesthetics, the unmatchable colours and most of all, the messages they carry awaken your emotions. These pieces need to be seen in person. Boodoo- Fortuné is not just talented; she also knows how to harness her skills to work effectively on different platforms. She does this without compromising the cohesiveness of her exhibition. The exhibition is no longer running, but the catalogue is available on the artist’s Facebook page and prints are on sale. 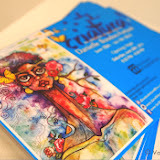 You can also check out Boodoo-Fortuné’s Etsy store for neat little gifts featuring her artwork.